Starting today, two of Canada’s largest cities, Toronto and Vancouver, are taking their civic and sporting rivalry online to decide which is the country’s most charitable city. It’s the Power of 2 – Toronto vs. Vancouver. The Power of 2 (www.power-of-2.org), a fundraising initiative dedicated to unlocking celebrity power for social good, gives celebrities (and this time, cities) the opportunity to go beyond the usual gala events and use social media to make meaningful social impact. There will be only one ultimate ‘winner’, but the real victors are the two food banks, Toronto’s Daily Bread Food Bank and the Greater Vancouver Food Bank Society. All of the funds raised will go towards pro-actively working to help end hunger in our communities. 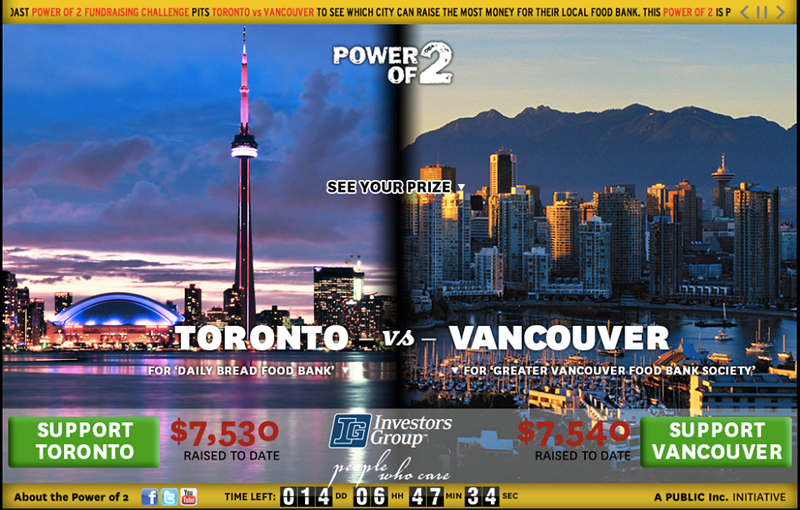 To get this Power of 2 ‘city challenge’ off to a great start, Investors Group has made a $15,000 contribution – $7,500to both Toronto and Vancouver. They firmly believe in the mission and impact of both Daily Bread Food Bank and the Greater Vancouver Food Bank Society. The Power of 2 is win-win-win: The charities get a big cheque to support their great work, cities get to show their civic pride, and everyone who supports the campaign will be entered into a draw to win a ‘5-Star Saturday’ in their city. You can give and share the campaign at www.power-of-2.org.